The ridge was now just fifty meters above, I pressed on and made the last paces in apnea. It was over: I climbed for almost three hours in the darkness, panting and cursing my heavy backpack and the 500mm, camera and tripod leaning on my right shoulder, to reach at sunrise the mountain meadow where I had found so many wolf tracks the previous week. Before getting over the ridge and thus reveal my human silhouette above the horizon, I ducked, placed camera and tripod on the ground, dropped my bag and crawled to the rim, binoculars in hand, to check the situation first. I slowly scanned the surrounding grassy slopes ending on that natural terrace: in the morning light a big herd of deer and a family of wild boars were peacefully feeding on the opposite side of the meadow. No sign of wolves. I retreated to change my wet shirt and eat a snack in front of the grand landscape. The sun was getting stronger by then. I moved back to the ridge and sat under a big rock, resting my aching back against it, in plain view: I knew it was over for that morning. The deer had immediately seen me and were now all staring in my direction: 160 eyes following my actions and making me feel naked. I had disturbed them and they started moving higher and farther. But then I noticed what seemed a deer resting alone and much closer. Just 100 meters from me and partly hidden by a bush of juniper. I raised the binoculars: a spectacular wolf in its prime winter coat was sleeping, completely unaware of my presence! I could see its ribs rising with the breathing and its legs moving frantically: it was dreaming. Although I could have photographed it already from my position, I didn't think twice and in a bunch of seconds I was already dragging my camera setup to find a better and more open view of the animal, for a cleaner composition. I moved carefully but I was completely visible: yet the wind was blowing towards me and I was confident the wolf would not notice me. Fast-beating heart and sweating hands, I was already tasting the images I would take that morning. Just ten meters to my left and I could admire the wolf in its entirety. It did not move. I checked it with my binoculars and I was shocked to see its amber eyes fixed on me, more curious than afraid. Instead on freezing immediatly, I hurried to setup my tripod and shoot. What a mistake! The wolf was already on its legs when I could focus my lens; it started running away as it heard the first burst of pictures. It all had lasted a few seconds and where before I was experiencing a precious wilderness moment, now only emptiness and silence were around me. After the wolf presence was gone and all the deer escaped, I was just in a mountain meadow: I had ruined everything. And because of photography. 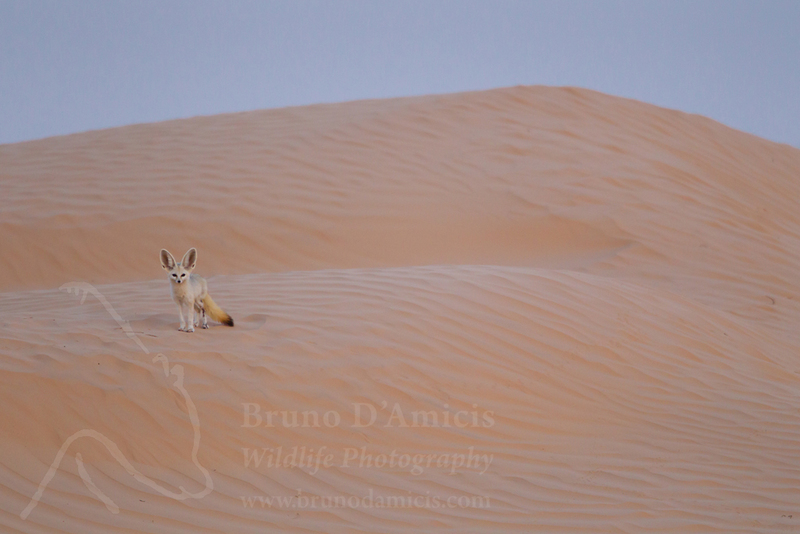 Three weeks of hard fieldwork had already passed without any fennec sighting. Me and my two assistants had criss-crossed 50 square kilometers of desert, just to find empty burrows and unrelenting sand storms. In this time span, I had taken maybe less than 100 images (mostly landscapes or wildlife tracks) but my camera equipment was already full of grit. I had come all the way from Italy to southern Tunisia to start a photographic project on the fennec fox, but until that day all which could justify my decision was a single fox track in the sand and the stories of my guide, Bechir. But things were now about to change. We had moved farther from the village, to explore a more remote patch of desert and make use of a military post and its nearby well as base camp for ten days. Wind was blowing strong when we arrived and for the next two days, the moral was low and we couldn't do much else than sleep, read or play chess. Eventually on the third morning the air was still and crisp: perfect for tracking. Full of expectations, Almost immediately and not even one kilometer from our camp I came across a fresh fennec track that looked as etched in the sand. I whistled to my assistant and we started following it. We followed it for one hour, up and down the small dunes. It took us first to an old nomads' fireplace, then to a fresh pile of camel dung, then to a gerbils' den (where the fennec had dug a hole) and after a couple of loops almost back to where we first had found it and then, it disappeared! “Impossible”, I thought, and once again I let despair take over me. On that moment the whole trip, which was supposed to be the beginning of a great project, instead started looking like a big failure. “Bruno, regarde ici!”, Bechir called from behind a nearby shrub. He had found again the track, which had been partly erased by a soft breeze and was now going into another direction. We walked behind it as it kept going in a straight line, as if purposefully towards something. It was exciting and we started walking faster. Eventually it brought us to a patch of small dunes covered in retam bushes and other shrubs. Ten more meters and it disappeared again. But into a small burrow this time. The fox tracks were also all over the place, crossed by the smaller ones of its pups: we had found our treasure! With the belly full of butterflies, we winked at each other and quickly made our way back to camp to not disturb the den: I would have gone back in the middle of the day, alone and with my camouflage tent, in the hope to watch the foxes coming out at dusk. At noon the breeze grew stronger soon becoming a fierce wind, blowing sand into nostrils and eyes. Although I knew it was risky for my equipment to take pictures in such conditions, I went to the den anyway, if not just to glimpse its residents and finally see my first fennec! I walked softly, on bare feet, and concealed myself under a shrub and behind a dune some 200 meters from the den, terrified at the idea of disturbing them. Like most of the canid species, in fact, fennec foxes do immediately move their pups to a different den if threatened. The hours passed slowly, then evening came and with it another gorgeous sunset, but the wind was blowing hard, making it difficult even to keep the eyes open. If something was living in the burrow, I could not see nor hear. Besides, all my worries were for the equipment sadly full of sand. All this struggle for nothing, I kept on thinking. That night, the dinner was a silent one. We were all tired from the previous weeks and desperately in need of a breakthrough. On the next day, I was already up one hour before sunrise and walking carefully towards the den and the lookout point of the previous day. It was a peaceful morning. When the sun rose I had not seen anything, so I approached the den to check if there was any sign of activity. The sand around the burrow was untouched and I was then sure the foxes had moved right after we had found it. It was enough and I was ready to go back home: I was wasting my time there. Back to camp, I recall Bechir and Zyed, my other assistant, breaking my stubborn silence and begging me not to give up but to try again the coming evening, which looked promising because of the wind absence. “Le fennec n'aime pas le vent” kept on saying Bechir. More to please them than with a real purpose, I took equipment and water and walked the distance to the den, this time hiding among some vegetation a little closer to the burrow. “At least, I will be a little more comfortable...” I thought. It was again a long waiting and I was sweating copiously under the camouflage blanket in the afternoon heat. Dozens of flies kept on harassing me as long as the temperature didn't decrease at sunset. Thirty minutes after the sun had dropped beneath the horizon, the sky and the highest dunes were still pink. It was then when I glimpsed a little whitish shape apparently flying on the ground. The first fennec fox of my life was an adult one returning to its pups. It was much smaller than I thought; beautiful as it ran with its incredibly light pace, which almost didn't move the sand grains under its paws. I guess my face blushed for the deep emotion as my hands trembled when I tried to follow the fox in the viewfinder. An istant before it reached the burrow, two fluffy balls bolted out from it. I don't like to use human adjectives to describe animals, but those two fennec pups were THE cutest thing I had ever seen in my life. In a fraction of a second, they were already lying under the mother suckling milk. I was so grateful and could not believe my luck, because I was watching something that few humans had ever witnessed, let alone photographed! I “woke up” and started taking pictures, although the dim light was asking for dramatically long exposures. But, in the fossil silence of the Sahara, the shutter of my camera sounded like an hammer against the anvil. No matter if I was using the “silent mode” and that my camera was engulfed in a cumbersome blimp: its noise was still impossible to conceal. After two single frames, the female was already looking into my direction. And, although I was well concealed, she could figure something was not right. One more frame and she flew behind a dune; the pups diving back into the burrow. I should have been happy: I had finally seen and photographed my first fennecs, documenting a unique moment of their life! But, once again, I felt as the magic was over. Sure enough, the female moved her pups overnight and it took me five more days to locate the new burrow. I could carry on my work, then, but with more care than on this first encounter. Still, a moment like that didn't repeat itself anymore during my stay and I wondered if I should have enjoyed it without taking pictures instead. Now, these are just two stories among many, but as usual my pen took me much further than these pages allow. I lost count of the times when I regretted being a photographer. Once it is the pathetic weight of the backpack to ruin a walk; once it is the noise of the camera to scare an animal; sometimes it is the worry for the safety of the equipment to curse a journey, but above everything is the urge of taking good pictures that can often spoil our best moment. Photography claims for such a high attention for details, in fact, that sometimes it can be a serious obstacle to a direct experience of Nature and makes me often think to give up on it. But, then, I wonder: would I ever climb for three hours in complete darkness with twenty kilograms on my back or spend four weeks roaming a desert, if there would be no challenge of making an experience timeless and accessible to everyone else through the impact of a good picture?